I had bacon on my mind all day. Not sure why or what. It could have been a combination of memories: Saturday morning, cartoons, orange juice, and bacon. Surprisingly I only have about a slice of bacon on top of a pizza today. Nothing too extravagant but at least I had a taste. Normally I get in good 6-12 slices in. To compensate, I made this t-shirt. I was going to make a t-shirt that said, “I love bacon” but I noticed that there are already a couple of shirts and apparel that had it. 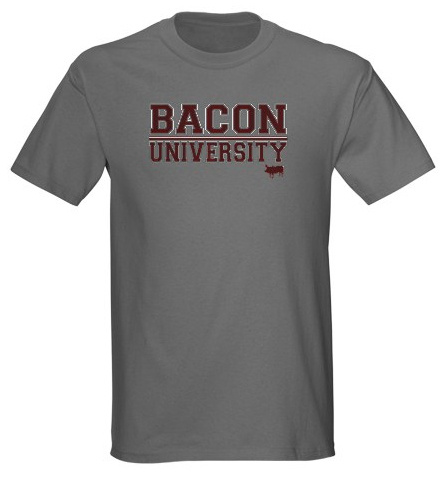 I decided to go whole hog and make the bacon university shirt (and more) with the thinking that one of these days I’ll open a university dedicated to bacon and all the other tasty parts. I figured I should throw it up on Café Press just in case there are other bacon lovers out there. Take a look at the store. Buy the shirt if you’re a bacon lover like me. I have yet to make my own bacon. A coworker of mine sent me this link: http://ruhlman.com/2010/10/home-cured-bacon-2.html. I hope to do this at some point when the weather starts getting cooler. Oh, I almost forgot why I wanted to blog this. It took me 20 minutes to setup my store. 10 minutes to create the graphic and 10 minutes to walk through the instructions on Cafe Press. Yes, there are other websites out there that allow you to upload your graphic and throw it on anything but I decided to use Cafe Press because of all their “plug-in” support for things like WordPress. I’m sure they have other plug-ins for other applications. The other reason why I chose Cafe Press is because they are the only ones I found who will print on a Sigg bottle. Please take time to browse the store and buy. I’ll be making more bacon related items soon. Maybe I’ll throw up my other stuff. Added my “I Make Stuff Up” logo to the store. Take a look!